For our very first inside the studio feature we are staying (extremely) close to home and having a look behind the scenes of Georgia Bosson Studio. Before this gets too confusing lets clear a few things up - the voice you are reading is Georgia’s (hi!). 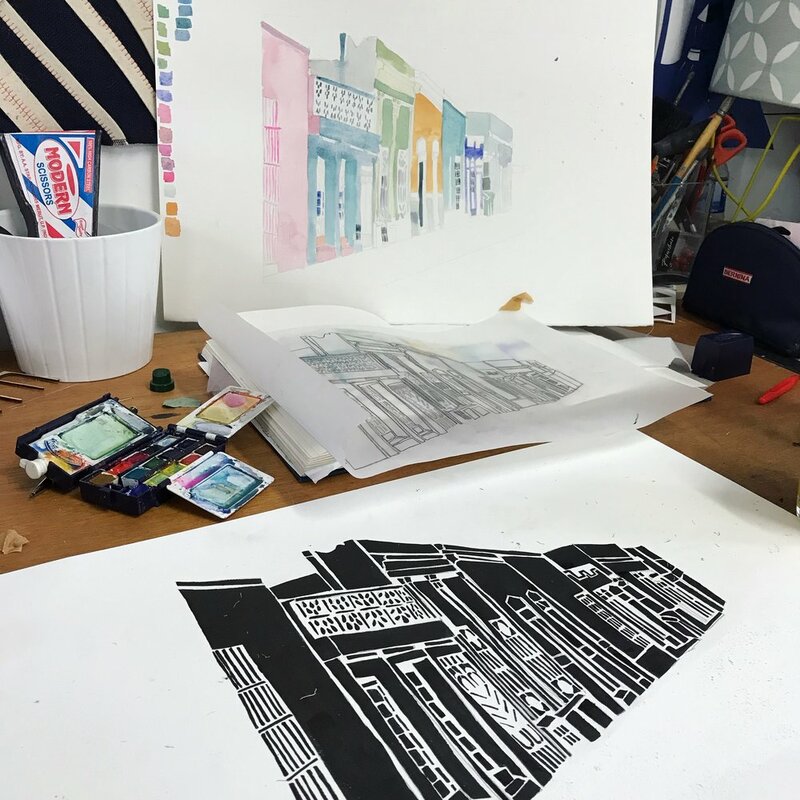 This blog post is going to stay in the third person for consistency (and because I like to make my life difficult) but the point of Makers House is to showcase the process behind the product and for that we (I) think you probably need to meet Georgia (me) first. Phew that was complicated…. So, before we get to the fun stuff here’s a brief history of everything; Georgia set up Makers House out of frustration with the lack of exciting, affordable exhibiting opportunities during the London Design Festival. Having shown with Design Junction and Top Drawer Georgia was after something a bit more personal. There is nothing quite like a white trade show box to take all of the joy and life out of a product, so she was looking for a way to show products whilst also answering the eternal question ‘so do you actually know how to make this stuff?’ - It is amazing how often that gets asked. And so to answer that question she set up an exhibition (there was probably an easier way but there you go) she pulled in a few talented friends and with the help of the wonderful South East Makers Club, Makers House was born. Now here we are almost three years later and it turns out exhibition design and curation is something Georgia loves to do alongside her own practice (more on that further down). More of this story will leak into these blogs as the weeks go on but for now you are probably ready to see a few fun studio images so we will move on to the real reason for the blog…. So here I am interviewing myself… enjoy! Share a photo of you at work and tell us about your favourite working days. Here I am doing my favourite thing - cutting a paper stencil for a print sample. If I was allowed to only sample and never make a finished product again I would be so happy! I love the process but dread the final decision to take one idea forward and try and make some money from it. So if anyone wants to pay me to just play in my studio all day then get in touch! I am always starting a new idea and always have at least three projects on the go at once, it is something that thankfully I don’t struggle with at all. I love drawing and experimenting with turning my drawings into prints for both fabric and paper. In the image above you can see an idea go from the initial drawing into something much more graphic and ready to be screen printed. I always test my ideas with paper stencils first before committing to having a screen exposed so that I can play with the scale and composition without having to commit to anything too permanent. Show us your workspace, is it clean or messy? I think this image says it all really, i am incredibly messy when I am in the moment and working on an idea (and all the other times too if I’m honest). 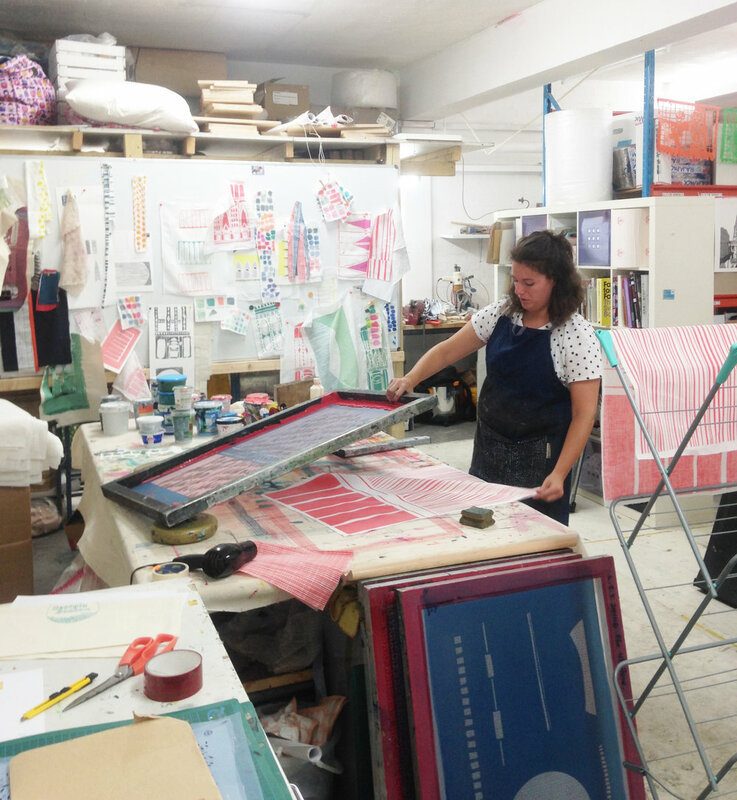 I take up a lot of space and am eternally grateful for the patience of the people that I share my studio with. This photo serves a few purposes, firstly it’s fantastically anonymous so is here to represent all of those behind the scenes who keep the machine rolling. From the graphic design to driving endless products around there is a lot of help behind the scenes that doesn’t get mentioned enough. The photo also serves a secondary purpose as I get a lot of my work stitched by inmates of Downview prison, and for obvious reasons can’t share a photo of them at work. The women I work with are on a programme which not only provides paid employment but also enables them to train for a qualification in industrial machine work so that hopefully the cycle can be broken and they can find meaningful employment after their sentence has been served. I really believe that any products that are brought into the world should do something good along the way, it is one way of moving towards a more circular economy with less waste and a bit more goodness in the world. This is my bedroom looking uncharacteristically tidy… I love sleep so this seemed like the best space in my flat to share! It also features my favourite makers purchase - a beautiful Eleanor Pritchard blanket. I brought it in her annual sample sale using the money I had made at a market the day before and have loved it ever since! The pictures on the wall are also by artist Laura Gee, our home is filled with things made by friends it’s eclectic and full of colour which is why I love how calm the bedroom is. Fun fact: it took me fifteen attempts to choose the right wall colour and even then I still couldn’t choose so we have two different tones on the walls! 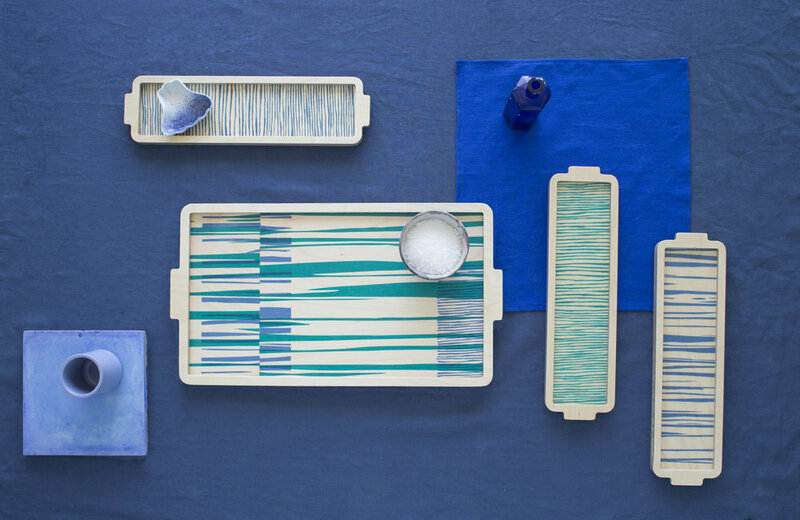 This is from one of my favourite photoshoots featuring my first collection of screen printed plywood trays. Whilst I love to work with textiles these trays are my favourite product in my shop, they are a great way to introduce a bit of colour and pattern into your home without feeling too overwhelmed - they can also be put away so don’t need to coordinate with the whole house! Photograph by Chris Lee. And that’s a wrap - I have to say it has been very weird interviewing myself but I hope you find it interesting to see a bit of the story behind the finished products that you see at the shows. If there is anything you think we have missed out or would like to know please comment below and we will make sure it is in the interview list for our next makers!